Living in Edinburgh, I am familiar with statue of Wojtek in Princes Street Gardens but didn’t know a lot about the real story. I was really pleased to get the chance to read Jenny Robertson’s novel for children telling his story. As you can see it has a beautiful cover and it’s also charmingly illustrated throughout by Tim Archbold. Children will enjoy following the antics of the bear cub Wojtek ‘adopted’ by Polish soldier Piotr in this entertaining book, especially when he gets into all kinds of bother in the quartermaster store, is frightened by a donkey and has a vodka too many. It’s a good introduction to what life was like for Polish soldiers in the Second World War, and doesn’t shy away from talking about the realities of war but in an appropriate way for children. The book brings a human face to war looking at Piotr’s family before he joined the army, when they were taken by the Red Army to Russia. Their difficult and dangerous journey ending in up in a prison camp was vividly described. Wojtek the bear is literally a larger than life character who children will adore. It was fascinating to read about how he actually became a help to the army rather than just a mascot. It was also interesting to read about what happened after the war when he came to Britain and spent his final days in Edinburgh Zoo. 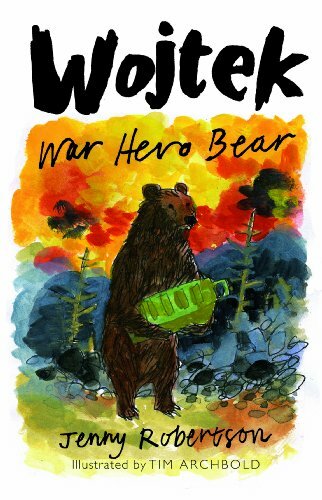 Wojtek, War Hero Bear is a book sure to be enjoyed by young readers. I had never heard of this hero and have been to Edinburgh several times. the book looks lovely.